spare me from asking what I will do. My gaze shall prostrated at his door. I'm going to meet my dawn at the tavern! Unke ghar mein ujaala karenge! If it (by coming to my house) brightens up your house! Never will I complain about your indifference.
. Audio, sung by Sufi Qawwali Maestro, Nusrat Fateh Ali Khan. Click to download the song: Unke Dar pe Pohanchne to paayen (if I reach at his door). < right click to Save the Link as mp3 file. Qawwali is the genre of devotional song offering of the Sufis of Indian Subcontinent which often represent the intense devotion to God, His Holy Messenger, the Elect Saints and Spiritual Masters. This particular song can be interpreted as a devotional song dedicated to the Holy Messenger Prophet Muhammad, upon him be holy benediction. At the same time this can be interpreted for one's own Spiritual Master who belongs to the Elects. 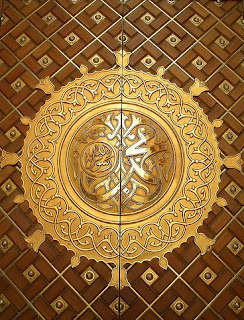 The Door talked about - on physical side represents the Door of his holy tomb where his body is laid at rest at Medina, (Masjid an-Nabawi) Mosque of the Prophet, this very place was his abode during his physical presence in the world and also where he is buried after his Union. On the spiritual side, the intended door represents his lotus feet in the realm of Unseen. "To be the dust under the feet of Muhammad" is a holy aspiration for all the sufis. Celebrated sufi mystic Rumi says: "I am the slave of the Qur'an and dust under the feet of Muhammad, Anyone who claims otherwise is no friend of mine." The Praised Station (Maqam al-Mahmuda) of Mustafa is the Door the sufis wishes to reach near. This ecstatic song is an attempt to gaze at the possibility of what shall this lover will do if he reach at that Door. In the Qawwali 'Cup Bearer' is God, 'Cup' is His Holy Messenger. Divine Wine with which 'the cup is filled' - is the gift of divine bliss. A holy spring, from which drink those Nearest to Allah. From sufi esoteric perspective, 'filling the cup' is the divine gift of Haqiqa-e-Muhammad, gift of Muhammadan Reality. 'Fire' represent the spiritual ecstasy, the fire of ishq. Invitation of 'Darkness to own house' is the Dark Night of the Soul that every lover / seeker must go through. Breaking the bond and 'indifference' represent the separation, an essential precondition that intensifies the longing for union. May our heart be made open to the Master of all Mystics, Beloved Muhammad and may our heart be graced with the pure love worthy of his most honored and praised spiritual station. Allahumma Salle Ala Sayyedena Muhammad.